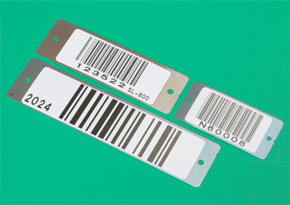 Dantech, an established supplier of asset identification labels and markings for harsh environments also supply heavy duty stainless steel barcode plates with text and barcode securely embedded in the steel. Stainless Steel Bar Code plates can endure tough environments, especially in food processing, medical and laboratory facilities where frequent cleaning and strong caustics are an issue. Made from durable 0.4 mm thick type 304 stainless steel, these ID nameplates are highly resistant to the strongest acids and caustics plus they can also withstand intermittent heat to 400°C. By fusing the ceramic image to the plate the heat of the laser is used to provide a durable, long lasting bar code which will withstand the harshest conditions even if the identification plates are subject to extreme temperatures and conditions. The barcode ID nameplates can be supplied with a strong 3M VHB adhesive which will resist high heat and chemicals or with holes for mechanical fasteners. As a leading provider of asset labels and metal plates, Dantech has an extensive knowledge of many industries and our customers include companies with manufacturing plants and warehousing as well as schools and universities, health sector organisations, the police, local and central governments. For more information on asset labels and ID plates call 01354 688 488 of complete our contact form.